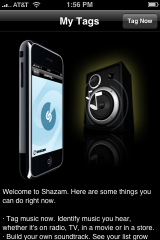 Shazam is an application that identifies a song just by holding your iPhone in range of the song that is playing. That means when you are in the car, watching a movie, grocery shopping, sitting at the pool, hanging out at Starbucks or where ever you are…if you hear a song that you like but do not know the title of the song or the artist, all you need to do is open Shazam and voilà….it will figure it out for you! 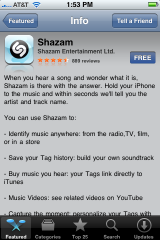 I must say, Shazam is quickly becoming one of my favorite App Store applications! 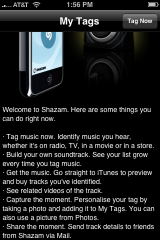 When you open Shazam, you will get an intro screen giving you information about the application. 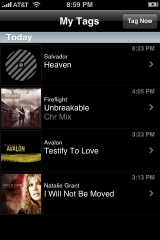 To identify a song while it is playing, select the Tag Now option in the upper right corner. This will bring you to a screen that will “listen” to the song. When it is finished “listening” which takes around 15 seconds, it will automatically bring up the information for that song (be patient, you may have to wait a second for it to give you the info). 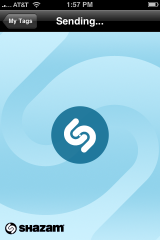 If Shazam was not able to identify the song, it will give you a screen saying they were unable to identify the song and give you a few hints on what might be wrong. If Shazam does identify the song, you will get an information screen. 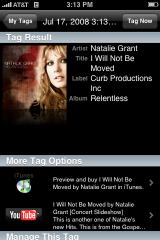 The information screen displays the Artist, Title, Subtitle, Album Art and Album for the song. It will also give you the option to preview and purchase the song via iTunes and the option to view a YouTube video in relation to the song. If you scroll down a little more you also have the option to Take and Attach Photo, Attach Album Photo, Share Tag and Delete Tag. The Take and Attach Photo and Attach Album Photo options allow you to change the Album Art photo with one of your own photos. However, it will only display your custom image when the information screen is open. On the main Tags list, it will still display the original Album Art. If Shazam does not find album art for the song, it will pull in a default image. 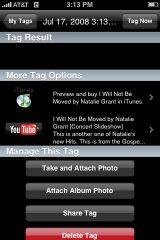 The Share Tag option allows you to email a Tag to another person. However, the person you email the info to cannot actually view the Tag unless they have Shazam on their iPhone too. They are able to see the title and artist of the song but, not the entire Tag. Honestly, I couldn’t get this option to work. It would send the email but the “click here to add this tag to your list” link did not work. 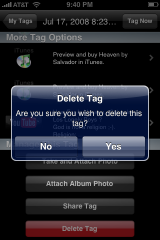 The Delete Tag option will delete the Tag you are currently in. Once you are finished viewing the information, you can select My Tags in the upper left corner to view the main list of your Tags (a tag is created every time Shazam identifies a song). The main list of Tags is where the application will open from now on. Overall, I found this application was able to identify songs about 90-95% of the time (based on the genre of music I tested). I’m sure this number will vary based on the type of music you are trying to identify. 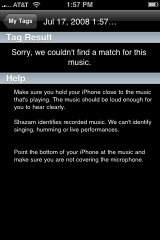 Also, Shazam is only able to identify recorded music…that means no karaoke night for this app. I really like this application and will definitly be keeping it around for a while. Let me know in the comments what your experience has been with Shazam. Click HERE to download Shazam via the App Store. Oh yeah, I totally remember Listen by Erica. I loved that app…then it got pulled! Yeah Listen was pulled because Sony found out that all the Listen users were connecting to their database. I wonder where this one connects to. This one is a winner. I tried some pretty hard tunes to stump this app and it got most of them, “just like magic” according to my daughter. Would be a shame if they started charging for the app or the data. There is another app on the app store does this, but it alos lets you sing or hum the son or just say the title of the song, but Shazam sems to work much better. This is a very impressive app. I used it to identify an African song I have had for about a decade – didn’t know the singer or album name (don’t even know the language the song was sung in) and Shazam identified it in 12 seconds! Very impressive. Success rate at about 95%, even for exotic songs. Incredible. I totally agree. This is a superb app. It identifies songs from different languages as well not only English ones. Oh man my ipod touch wont be able to have this app. this is lame. sounds like its a stupendous app. Thanks for writing in to ask for clarification. The application is Free and Shazam is not charging you anything for using this version of our service, so don’t hold-back from using it! With respect to our applications in the future, we’ll communicate with you regarding upgrades or new application versions via the App store itself – you’ll get little indicators for upgrades, so don’t ignore them. We will look to enhance the application and continue to bring our new features, and, we may need to upgrade the application in order to continue to support the free version, as it does cost us considerably to provide the service. Keep posted but don’t worry, we’re not going to abruptly shut-down your Shazam. Would you mind letting me know which country you are in and if you downloaded Shazam on first generation iPhone or the new 3G? 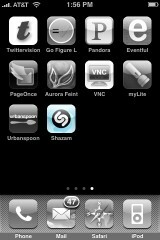 Did you find Shazam on your own (i.e. checking out iTunes App Store) or did a friend put you on to the app? 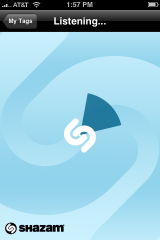 Enjoy tagging music and building your own soundtrack of your life through Shazam! Thank you for your support. ANYway to get this app to not make my phone vibrate once it sends information?? Does anyone know how to download the album artwork from Shazam directly to your iTunes? Or am I just being flat out lazy? How can I get Shazam in India? My sister in singapore has this on her iphone 4s. But when i searched it in the app store, it doesn’t appear on my iphone. It just says it cannot complete my request. Im here in the philippines and it can also identify local songs. Im just in awe how great this app is and i wana download it for myself. Any kind soul who can explain my problem?